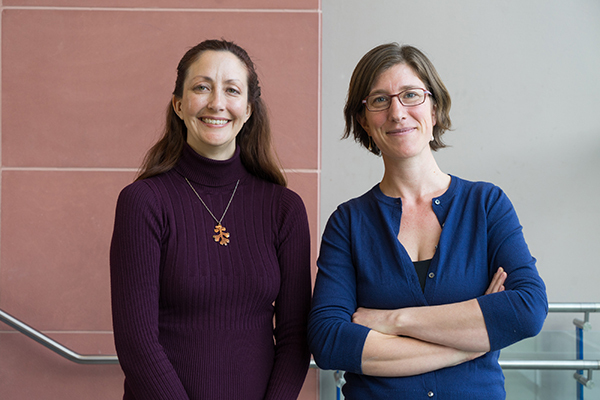 Recognizing its robust research, scholarship and creative activity, San Jose State celebrated the latest recipients of the Early Career Investigator Awards. The work of Rachael French, an associate professor in the Department of Biological Sciences, and Miranda Worthen, an assistant professor in the Department of Health Sciences and Recreation, were featured at the annual Celebration of Research awards ceremony Feb. 16 at the Compean-Diaz Student Union Ballroom. French has generated more than $1.2 million in external funding to support her work examining how development of the common fruit fly is affected by laying its eggs in the alcohol-rich environment of newly rotting fruit. Financial backing for her studies, which started during her post-doctoral days at UC-San Francisco, comes from the National Institutes for Health and the National Science Foundation. Her research is aided by three graduate students and six undergraduate SJSU students. During a brief presentation at the event, she explained her research — which has revealed the development and long-term survival of the flies have been improved by providing them with a low-fat diet — bodes well for finding eventual treatments for Fetal Alcohol Syndrome among humans. There are similar traits between humans and fruit flies born in alcohol-rich environments. In both, growth can be stunted and death rates higher. Providing young flies a low-fat diet has a protective effect, she said, generating normal survival and development rates. Worthen told the audience her research into public health and social justice issues — including examining the plight of people who have suffered trauma, such as victims of gender-based violence and military war veterans — has been influenced and informed by her own background as having overcome a rare genetic disorder at birth. More recently, she has dealt with an unusual health condition her young daughter exhibited shortly after birth. She acknowledged the presence of her mother, Kaethe Weingarten, a retired associate clinical professor of psychology at Harvard Medical School, at the ceremony. She said her mother sparked her interest in these issues during childhood. The mother-daughter team has co-authored academic papers. “My mother always impressed on me your own personal experience can have an important impact on your research and the questions you ask,” Worthen said. She said she regularly impresses on her students that important issues in their lives should have an impact on their research and academic careers. In addition to the Early Career Investigator Award winners, many of this year’s 16 student/faculty research teams were in attendance to present informational posters about their own projects. Some of those present included Briza Diaz and Citlali Hernandez — students of AJ Fass, an associate professor in the Department of Anthropology — who conducted research into the economic and social effects from the 2006 eruption of a volcano near the small village of Pusuca, Ecuador. Diaz said Fass asked the pair to translate Spanish-language transcripts of public meetings during a campaign to resettle about 200 individuals and families who lived in the devastated region. Julia Regalado, a student, and her faculty partner, Susan L. Ross, an associate professor in the Health Science and Recreation department, shared their research findings.The pair studied the impact of seven types of stimulation — including music and forms of tactile therapy — on children in persistent/permanent vegetative states. Ross said several of the approaches yielded positive results in evoking responses from the children.